Big enough to hold lamps, books, and magazines while small enough to save space, this chairside table is the perfect home accessory. Custom antique pewter cup pulls, tapered legs, and thick slated shelf gives a contemporary transitional style that can be both casual and formal. Solid maple wood and selected maple veneer rails provide sturdy support and high quality construction. Customize your table with several different maple stains and all of the Custom Color paint and finishes for a unique look. Mild physical distressing standard with Custom Color paints. The Arbor Contemporary Compact 1 Drawer Chairside Table with Slatted Shelf by AA Laun at AHFA in the area. Product availability may vary. Contact us for the most current availability on this product. Wood & Finish Our Custom Colors program gives you the opportunity to customize your furniture selection; to truly reflect your decorating needs, knowing that this furniture was made exclusively for you. Select the piece or pieces of furniture from our wide assortment. 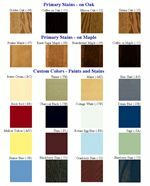 Then choose your Custom Colors, stains or paints, and the finishing options all stain, all paint, or various combinations of stains and paints, standard or deluxe. The final creation is then truly a one of a kind selection, finished by our skilled craftsmen and women. Handles & Hardware Hardware is collection specific for all A.A. Laun collections. This collection features antique pewter cup pulls. Drawer Suspension Full extension side mounted ball bearing Premium Slides which give the drawers a high quality fit and feel. Every living space should feature accent pieces that enhance your furniture while also providing functional storage. Outfit your home with the Shaker inspired Arbor accent table collection that is fully customizable in multiple maple stains and a total of 16 Custom Color paint and stain options to match any home decor or contrast for a decorative splash of color. Each piece is constructed in solid under shaped character marked maple tops combined with tapered legs and slatted shelves, giving a substantial yet fresh feeling. A key characteristic of this collection is versatility - the contemporary transitional style allows each piece to perform as both casual and formal styles. Antique pewter cup pulls accent drawers and doors. Mild distressing is standard with finish options. Customize your home today with the Arbor accent table collection. The Arbor collection is a great option if you are looking for Contemporary furniture in the area. Browse other items in the Arbor collection from AHFA in the area.